We have entirely updated all DIBELS content to DIBELS Next, 6th Edition and IDEL. These are all now available to all clients. If you are using the old versions of DIBELS, please contact Illuminate immediately. 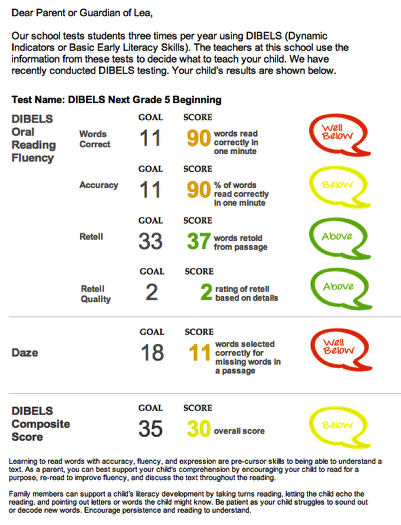 Titles- In the older version of DIBELS, you could not change the title of the assessments. Now, you can change the title and it will not affect the reports. 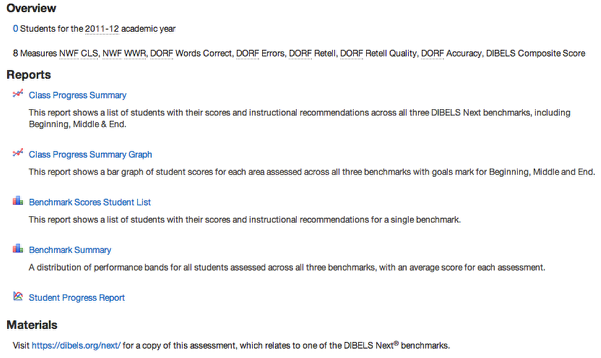 Once you have clicked on the title of a DIBELS assessment in your Assessment List, you will be automatically taken to the Overview page which houses all of the reports for a specific DIBELS assessment. Description: This is an abstract for the DIBELS Progress Summary report, which compares results from Beginning, Middle, and End benchmark assessments for each student. 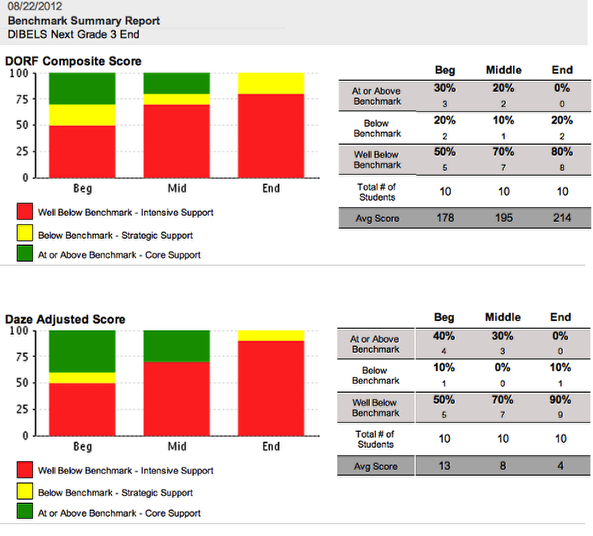 Purpose: Identifies each student's score and performance band for each DIBELS score field and Composite Score (DIBELS Next End Only) or Instructional Recommendation (DIBELS Sixth). 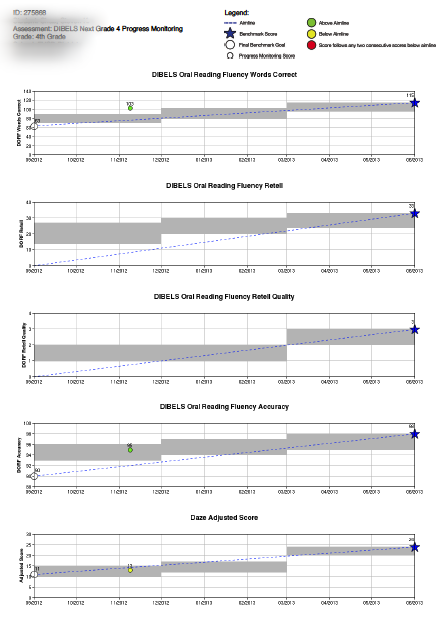 Description: This is an abstract for the DIBELS Class Progress Summary Graph, which summarizes results measure and shows student progress towards all cut points. This can be run at district, school and teacher levels. Purpose: Identifies student progress toward the cut point for each measure in an DIBELS assessment. Description: This is an abstract for DIBELS Benchmark Scores Student List, which provides results from a single benchmark assessment for each student. Purpose: Identifies each student's score and performance band for each DIBELS score field and Composite Score (DIBELS Next) or Instructional Recommendation (DIBELS Sixth). 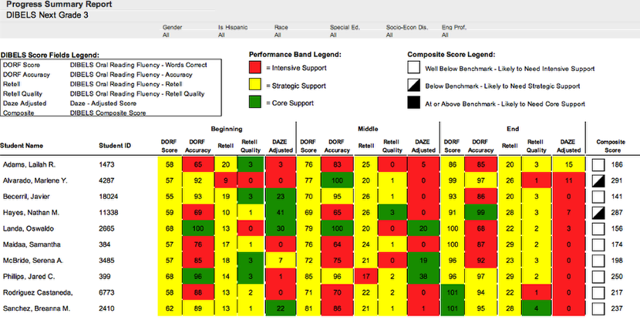 Description: This is an abstract for the DIBELS Benchmark Summary report, which summarizes results for each Score field on the Beginning, Middle, and End benchmark assessments for a specific grade level. Purpose: Identifies the number and percent of students in each performance band for each benchmark assessment in a grade level. Description: This is an abstract for the DIBELS Student Progress report, which summarizes results for each student on the Beginning, Middle, and End benchmark assessments for a specific grade level DIBELS Next assessment. Purpose: Identifies and charts the progress for each student in each section of a DIBELS Next assessment. Description: This is an abstract for the DIBELS NEXT Parent Letter, which summarizes, in letter format, results for their student on a DIBELS NEXT assessment. 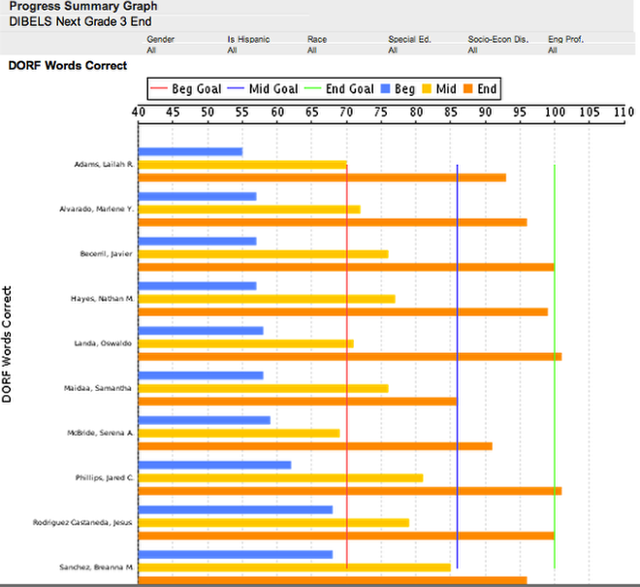 Purpose: Identifies progress for each student in each section of a specific DIBELS Next assessment for Parents. Each report will have the options to Filter by Date, Filter by Rostering, or Filter by Demographics(Additional Filters). These are all optional. To view the report you can View in Browser or Download to PDF. You can print these reports by clicking the Adobe symbol at the top of the page or select Print in the actual Adobe program.